Now that the first segment of “UFC 167 Primetime” has hit the airwaves, it’s safe to say the GSP hoopla train has officially left the station. 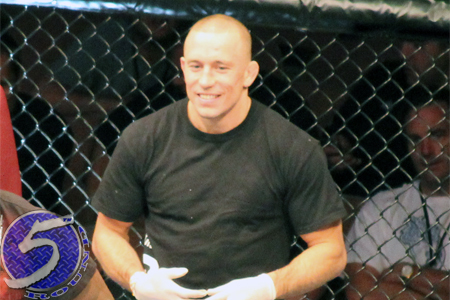 Everyone is well aware reigning UFC welterweight king Georges St-Pierre (pictured) defends his throne against Johny Hendricks on November 16 inside MGM Grand Garden Arena in Las Vegas, Nevada. However, the order in which their opening acts will be performing that night wasn’t finalized until now. A light heavyweight affair between Fox Sports 1 acquaintances Chael Sonnen and Rashad Evans serves as the co-main event. A thrilling 170-pound shootout with Rory MacDonald and Robbie Lawler gets third-to-top billing. Veteran Josh Koscheck, who could very well be fighting for his UFC life, meets Tyron Woodley and Ali Bagautinov vs. Tim Elliot round out the main card. The UFC’s Facebook page kicks off the festivities by streaming three preliminary bouts live starting at 6:45PM ET/3:45PM PT. Fox Sports 1 will then air the remaining four prelims at 8PM ET/5PM PT.